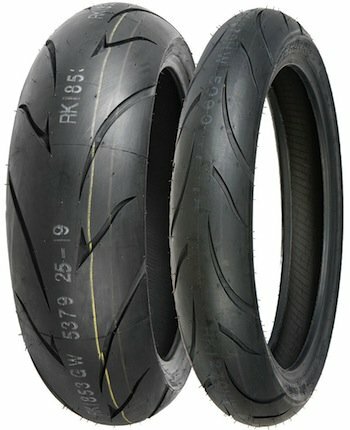 UPDATE 9-18-2013: After purchasing a front and rear Shinko 011 ‘Verge’ tire for my 2012 Suzuki GSX-R750, I’ve since put 5,000 miles on them and absolutely love them. They show hardly any wear, my chicken strips are only 1/4″ wide and I’ve never had any loss or reduction of grip in the corners. I’ve ridden with them in the rain a couple of times now and they have felt planted and solid. I paid $221 for the set from Motorcycle-Superstore.com, using a 10% coupon from a previous purchase and free shipping. I paid my local motorcycle shop, Yamaha Sports Plaza in Fairview, Oregon, $100 in labor to remove the factory Bridgestones and put on the Shinko’s. The reviews state that the 011’s are a high mileage tire and I hope to get 8,000 miles from the rear, more from the front. I’ll post again when the tires get within 80% of their tread life, so stay tuned. Meanwhile, the Shinko’s provide excellent grip with a completely neutral feel. When riding, I’m unaware of the tire, I simply ride as modestly or as assertively as I wish. They present no wobbles or vibration at any speed (I’ve had them up to 130 mph). Keep in mind these are not Z-rated tires, so it’s not a good idea to take them over 150 mph. I’ve ridden on moderately damp pavement and they performed very well. My chicken strips are only 1/4″ wide at this point. Keep in mind I’m new to sport bike riding and only have 4,000 miles under my belt on my GSX-R. On every turn, these Shinkos have inspired confidence to this relatively newbie rider (as of this riding I’ve ridden 60,000 miles total, most of it on my 2007 Suzuki V-Strom 650). I’m a huge fan of the Shinko brand of tires, feeling they are an outstanding value. They provide a lot of tire for relatively little money. The 011 Verge make a great tire for sport bikes, and unless they wear out after just a few thousand miles, I anticipate mounting them on my GSX-R750 for the foreseeable future. I took my 2007 Suzuki V-Strom DL650 to the shop this week for some mid-life maintenance. It now has 53,000 miles and other than a faulty TPS sensor, it’s never had a thing go wrong with it. Think about that for a second. That’s the equivalent distance of riding twice around the planet with only a single electronic sensor going bad. I’m having the coolant flushed and the radiator, hoses and clamps inspected. It’s getting some new shoes, another pair of Metzeler Tourance tires. I prefer Shinko 705s, as they have quite a bit more grip, especially on wet pavement, and a bit more off-road traction. However, I can only get about 5,000 miles out of a rear Shinko; the Metzelers give me 10,000 miles, which will last me all season. I’m also getting the battery replaced, not because of age but because I ran the current unit down by leaving my Garmin Zumo 220 GPS plugged in over night. It draws current even when powered off. Speaking of which, I’m having the shop re-route the GPS’ power cord to a switched circuit. This will prevent power from going to the GPS when the ignition is off. Finally, I’m having braided stainless steel brake lines installed, replacing the factor rubber hoses. I have put close to 7,000 miles on my set of Shinko 705 tires. The front looks damn near new but the rear has very little tread left down the center stripe and about 50% tread remaining on the sides. For an $83 tire, that’s a very low cost-per-mile. The Shinko’s have been outstanding tires, providing excellent grip in cornering and especially on wet roads. Normally I replace both tires at the same time. With previous brands, including Bridgestone Battle Wings and Metzeler Tourances, the front wore down enough to justify replacing it at the same time as the rear. With this set of Shinko’s, however, the front will last another 5,000 miles or so. As a result, I’m only changing out the rear tire. This is how I rode to work this morning. I will swing over to Yamaha Sports Plaza after work to have the new rear tire mounted. On the third try in a month, the NF46 road from Ripplebrook to Breitenbush / Detroit is finally clear of snow. They even swept the tree debris! On Sunday I had a fantastic ride to Detroit and back, scraping my left peg on a hard hairpin just below the pass. My new Shinko 705 radial tires are fantastic, providing excellent grip on wet pavement and confidence-inspiring cornering with increased lean angles. They posted speed limit signs from the pass south to Detroit varying between 40 and 45 mph, which is ridiculous. Those twisties are excellent and the road surface is in great shape.